At Viper Alley, we love hosting bar and bat mitzvahs. For such a memorable, special moment in a family’s life, it’s important to make sure all details are right and really showcase your child’s personality. The greatest way to accomplish this is to pick a theme that can tie food, décor and accouterments together. Here are 10 fun, festive themes to let your mitzvah shine and keep the party going! In the Chicagoland area, it’s common to find posters of Michael Jordan and Derrick Rose plastered all over bedroom walls. Whether you take in a Bulls game every now and then or shoot baskets in your backyard, basketball is surely a family, fun sport. Create basketball centerpieces, call for a shooting contest on the dance floor and top the cake with the figurines of your favorite players. If you’re providing giveaways, you can hand out jerseys with the mitzvah’s date and name on the back! We all have a sweet tooth. Make your mitzvah extra sweet by giving candy out as dance contest prizes, creating a mini “candy store” where kids can fill plastic baggies with their goodies of choice, or even featuring a chocolate fountain! You can have so much fun with a circus and carnival theme! Create giant lollypop centerpieces out of popcorn and hand out carnival-themed accessories, such as masks, red noses and big glasses. You can also even include a mid-party show, if you desire! Music lets the personality really come out! With so many different genres and instruments, it’s easy to vary them amongst different table settings. Plates can also resemble a record, for a more vintage, fun feel. You can even give out inflatable instruments to play with while they rock out to the beats on the dance floor. Disney movies are enjoyable at all ages. With so many princesses and stories to choose from, you can let your imagination go wild! Use princess’ or princes’ heads for table centerpieces and hand out crowns, tiaras, mermaid tops and fairy wings on the dance floor. You can also include a fun photo booth, where you can pose and take pictures as different Disney characters! The only thing more fun than one giant cake? Tons of mini cupcakes in a variety of flavors and textures! Invitations can be shaped as celebratory cupcakes and centerpieces can feature your favorite flavors! You can also have a DIY cupcake station for dessert, where every guest can choose a base and pile on the toppings! Icy extravaganzas can be really cozy due to the dim, blue lighting and also tasty due to all those ice-cold treats! With Italian ices and frozen hot chocolate shots in the room, the wintry theme can be showcased really well. Décor can include snowflakes, white branches with rhinestone studs and ice cubes that can glow in the dark! Warm the atmosphere with the addition of snuggly socks, featuring the celebratory name and mitzvah date, a s’mores bar and centerpieces of campfire wood. Invitations can be sent out in the shape of a bear’s face—we’ll know for sure that these bears are harmless! Take your mitzvah to new heights! Airplanes make great centerpieces and flight attendant “wings” with your child’s name on them can be handed out as party favors. You can also include an airplane nosh bar filled with miniature-sized pretzels, nuts, and cookies. To get more creative, allow guests to build their own bags from a selection of fun, snack foods! What could be more fun? Glow-in-the-dark accessories are fun for all ages. Pass around drink shooters in bright, neon colors. Color the dance floor with a plethora of accessories, such as glasses and necklaces. You can also use glow-in-the-dark balloons for the family’s entrance into the party! 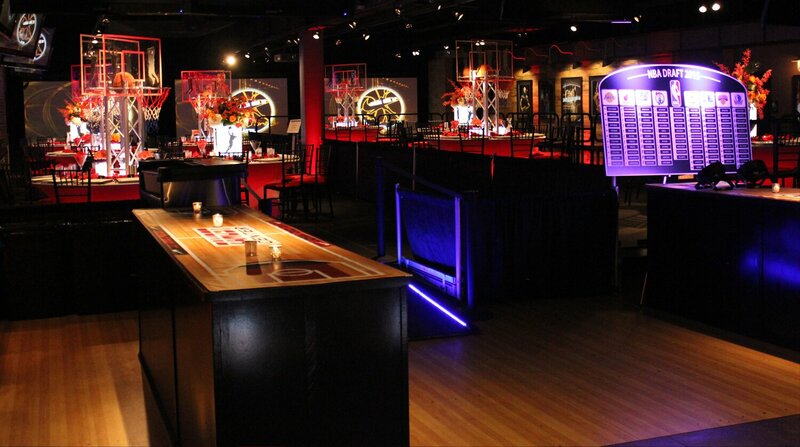 Ready to book your next mitzvah at Viper Alley? Contact Laurie Cohn at 847-499-5011!